"A man reaches out to touch the statue of Joe Paterno, the former Penn State football coach, shortly after hearing of Paterno's death outside of Beaver Stadium on January 22, 2012 in State College, Pennsylvania. Paterno, the winningest coach in major college football, died at 85 due to complications of lung cancer." State College, known as Happy Valley, turned into a somber depression this past week. Last Saturday, driving up late into the night with conflicting information of Paterno's death gave me a lot of time to prepare for the story that I'd be covering for Getty Images. On Sunday morning, I'd later come to find out that after taking a simple building mug of the hospital where Paterno was fighting for his life, that he passed, seconds later. From that point on, those in the community, whether students, alumni or residents, near and afar, would spend the week reflecting, remembering the man they knew as "JoePa." From chanting students at the bronze statue outside the football stadium, which was turned into a memorial, growing by the hour, to the quiet mourners filling every square-foot of concrete sidewalk through town, it was all clear, yet complicated to understand. Loss and celebration, hands joined at the memorial, tears shed at the viewings, it was a tranquil week that took an emotion toll on nearly everyone I passed and talked to. Though I try, it's difficult to sum up, I don't think a single adjective could describe the week. The above images are my initial edit of the second part of my story entitled, "No Joe." I never once saw Joe Paterno - not last time I was there covering his firing, and not this time assigned to document the reaction of his death. The first part can be seen here. I hope these images, from my previous visit and now, show and evoke an emotion. 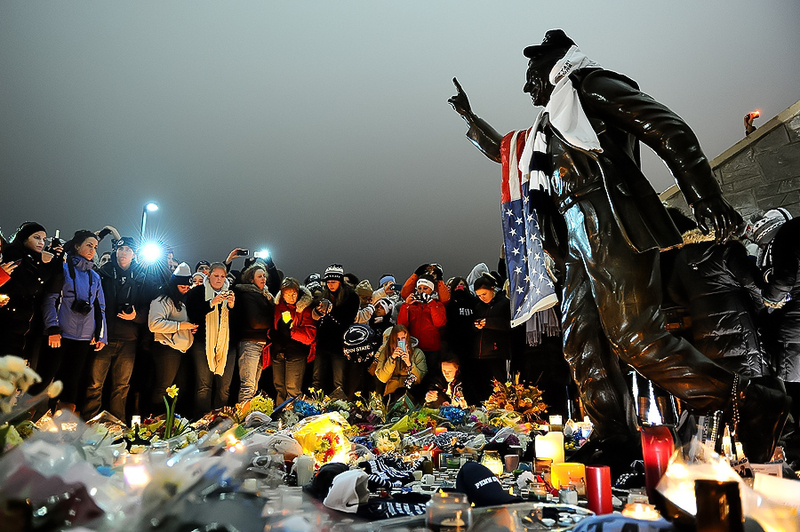 "Students, mourners and those in the community gather around the statue of Joe Paterno, the former Penn State football coach who died earlier in the morning, outside Beaver Stadium on the campus of Penn State on January 22, 2012 in State College, Pennsylvania. Paterno, the winningest coach in major college football, died at 85 due to complications of lung cancer." I've been in State College, Pa., covering the passing of former Penn State football coach Joe Paterno for Getty Images all week. It has been an emotional week for those grieving in what is known as "Happy Valley" and will continue today with a formal memorial. I wanted to quickly share a photo from a powerful moment during the week. Here is a short raw video of the night, too. More to come and more to elaborate on once I'm back in Baltimore. 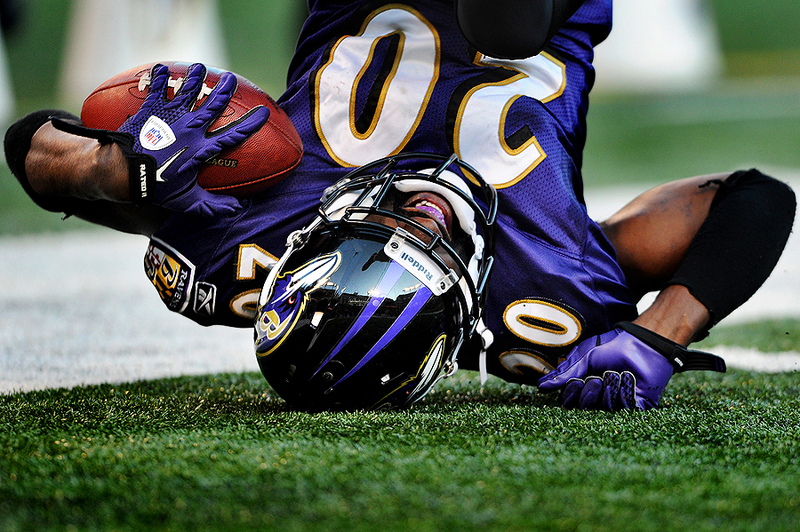 "Ed Reed #20 of the Baltimore Ravens tumbles after intercepting the ball against Andre Johnson #80 of the Houston Texans (not pictured) during the fourth quarter of the AFC Divisional playoff game at M&T Bank Stadium on January 15, 2012 in Baltimore, Maryland. The Ravens, 20-13, win advances them to meet the Patriots in the AFC Championship Game." One of the best pieces of advice I ever learned as an athlete was to never show your weakness. No matter how much you may struggle to beat an opponent, stay strong and finish until the end. The Ravens certainly showed some vulnerabilities and at times I absolutely thought the Texans would be moving on. But the Ravens finished strong and will be advancing to the AFC Championship Game next week. While I don't show my weaknesses, I will say not every assignment is as perfect as we wish. In other words, much like the Ravens, I've had much stronger performances, too. My friend Trent Nelson said it best, "You will disappoint your editors, clients, readers, and even your parents. But that's how you learn technique and develop style. So when it happens embrace it." It wasn't until late in the game when Ed Reed made an interception right in front of me to seal the victory that I made my favorite frame of the game. Sticking with the long glass on the play proved to be worth it. Alas, what I'm trying to say is that this was a mediocre game at best. Conversely, this past season has been one of my best NFL seasons to date, so I'll take one bad game a season at this rate. And since it would be a an act of Tebow god to get to shoot the AFC Championship Game next week, I'll chalk this one up and ready myself for the 2012-13 NFL season. 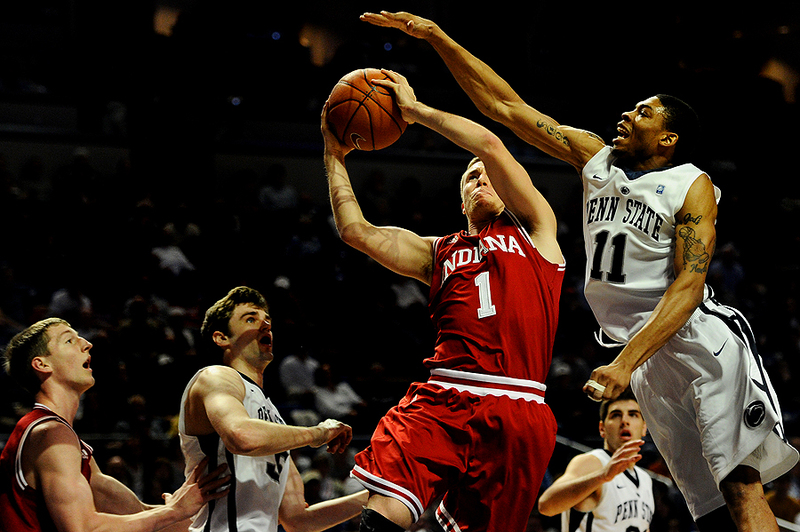 "The Indiana Hoosiers warm up before taking on the Penn State Nittany Lions at the Bryce Jordan Center on January 8, 2012 in State College, Pennsylvania. The Indiana Hoosiers won, 88-82." I got called out to post this picture because it was better than the last. Not sure about that. Conversely, I did agree that not one other photographer at the game saw, nor shot a frame, like the above. 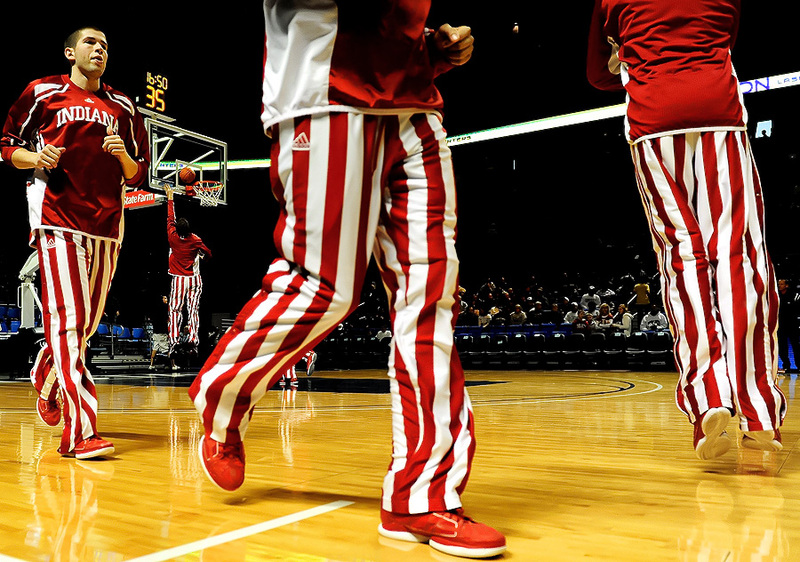 The pants of the Indiana Hoosiers inspired me the minute they took the court. I had to work the warm-up session. Recently, the University of Maryland took a lot of criticism for their circus like football uniforms. While I was one of the bizarre ones to love Maryland's new style, I was wondering where the fashion police were with the Hoosiers, as their pants were similar in style, color. Nonetheless, creativity and the dare to be great, whether anyone else thinks it's appealing or not, always gets the nod in my book. 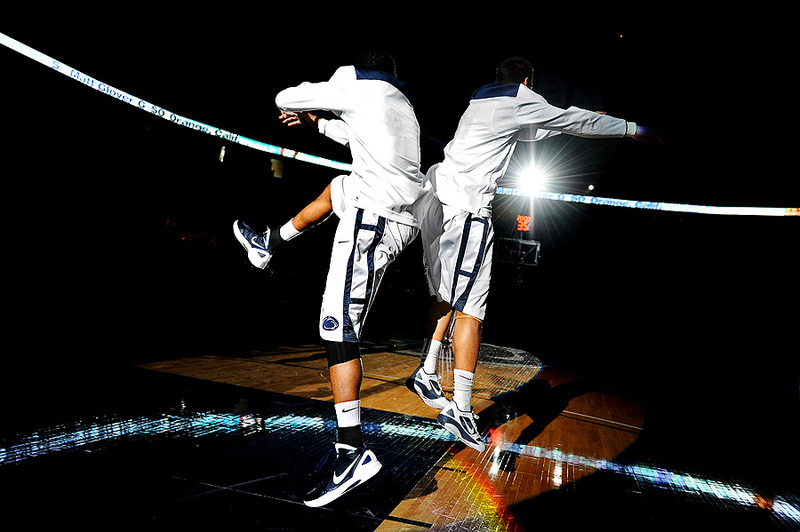 "Jermaine Marshall #11 of the Penn State Nittany Lions (L) and teammate Matt Glover #5 (R) are introduced before playing the Indiana Hoosiers at the Bryce Jordan Center on January 8, 2012 in State College, Pennsylvania. The Indiana Hoosiers won, 88-82." Was excited to get the call from Getty to head back to Penn State on Sunday. While I wouldn't be covering more news of the ongoing scandal during this trip, I was sent to document the Nittany Lions new head football coach Bill O'Brien. 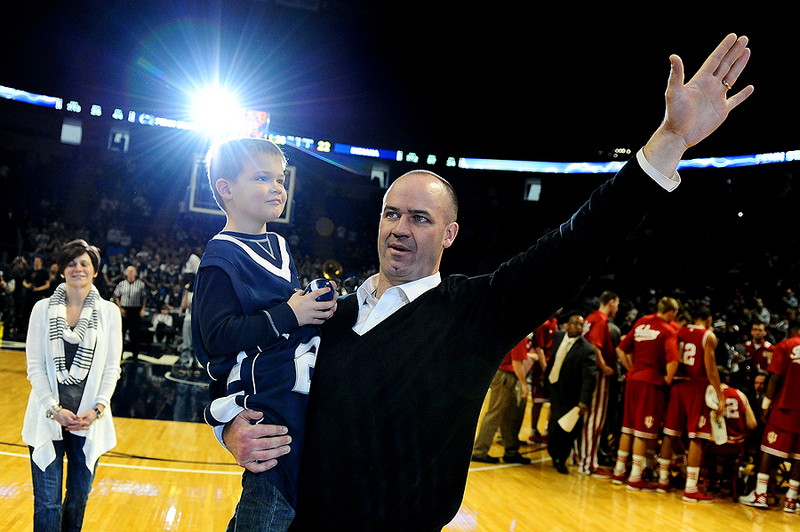 O'Brien was announced to the crowd, with his wife Colleen and 6-year-old son Michael, during a timeout at the Penn State men's basketball game as they took on the Indiana Hoosiers. It happened very quick. As photographers ran circles around coach, I stayed put and worked the spotlights that popped on after he walked onto the court. Before I knew it, he was back hidden (or gone for all I know) into the masses. Before, and afterwards, I shot game action. Despite being done with my assignment after the final whistle, I drove through town. Cruising down College Avenue in State College after the game was tranquil. Last year it was total chaos for a week. I searched to see if there was anything going on, but all was quite. I'd love to continue this story on Penn State whenever I can. But who knows long this story will continue to unfold. Not sure what I was expecting to maybe find after the game. I guess the store front I saw summed it up. It read, "We're 'still' Penn State." 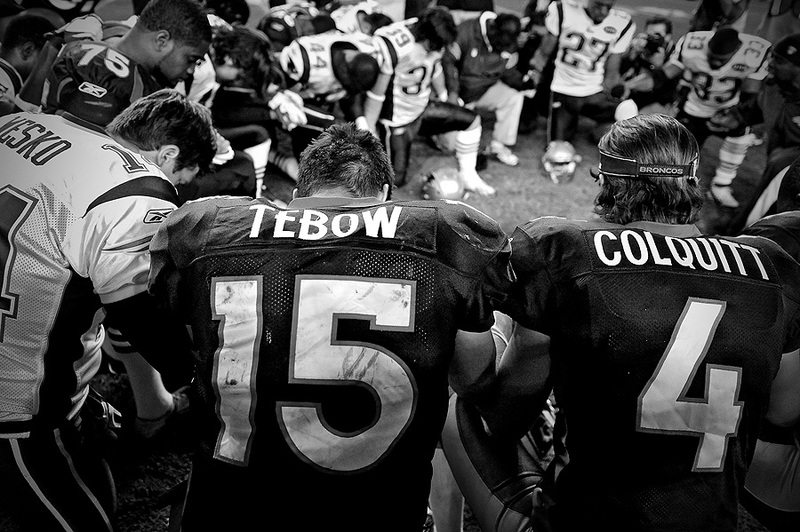 "Quarterback Tim Tebow #15 of the Denver Broncos prays with teammates and players from the New England Patriots after an NFL game at Sports Authority Field at Mile High on December 18, 2011 in Denver, Colorado." Happy New Year - I hope everyone had a great holiday. Every year, January is a time to reflect back on the year and search through thousands of images from the previous year. I always said, if you don't look at what you did before, you'll do all the same stuff over again. While it's a good to look back on the highlights and lowlights, I make sure it's short and sweet as I jump back into assignments and eagerly look forward to the new year. Here is to health, happiness and a exciting 2012.